Bostonians are fortunate to have a wealth of green space right within the city limits. But the crown jewel of all its parks has to be the Public Garden. And the month of May, when its vast array of flowers are finally in bloom, is the best time of year to grasp its relevance to our city. The Public Garden may be the first botanical garden in the country but it is far from the only place in Boston to check out spring's floral bounty. 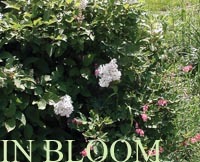 Garden enthusiasts will want to pay a visit to the Arnold Arboretum in Jamaica Plain, which hosts its annual Lilac Sunday on Mother's Day, May 11. The Arboretum was established in 1872 after James Arnold, a whaling merchant, willed part of his estate to Harvard University for the development of an arboretum that would "contain, as far as practicable, all the trees [and] shrubs.... either indigenous or exotic, which can be raised in the open air." Charles Sprague Sargent took up Arnold's cause with the help of famed landscape architect Frederick Law Olmsted and created a 265-acre natural haven that has since become part of the Emerald Necklace. Today the Arboretum includes plants and trees from all over the world and its library houses a 40,000-volume herbarium collection-including an extensive photographic archive. Yes, there's more than enough to keep the green thumbs in your life busy. In May, though, it's all about the lilacs. Of the thousands of flowering plants in the Arboretum, only the sweet-smelling lilac is singled out every year for a day-long celebration. But expect to see more than the purple variety common throughout the city. There are 230 different types of lilac found in the Jamaica Plain park, each selected specifically for its color and size. The flowers are in bloom throughout May but on Lilac Sunday, refreshments are available for purchase from 10 a.m.-4 p.m., Morris-style folk dancers perform, and picnicking is allowed in the park the only day of the year. If that's not enough to entice you to pack a lunch and plan a day among the blossoms, there's also a terrific view of Boston from atop Peter's or Bussey's Hill. Refer to listing. It is both America's first public garden and its first botanical garden, but the Public Garden didn't start out as the well-groomed floral haven it is today. The 24-acre park, established in 1837, was once marsh land just like much of the Back Bay where it's located. The massive Back Bay landfill project created solid ground for the garden and a contest was held to determine who would design its landscaping. Architect George Meacham won the job (not to mention its $100 prize) and then created the park enjoyed by countless visitors today. Fans of New York's Central Park may find the Boston Public Garden to be tiny in comparison. And that might be closer to the truth than they realize. A suspension bridge in the garden's center is said to be the smallest in the world and designed to look like a miniature version of New York's Brooklyn Bridge. And it's not the only toy-like detail that adorns the space. Countless statues are located throughout including a proud George Washington on his horse, sculpted by Thomas Ball in 1869, and a far younger sculpture commemorating the web-footed characters of Robert McCloskey's children's book Make Way For Ducklings, designed by Nancy Schon. 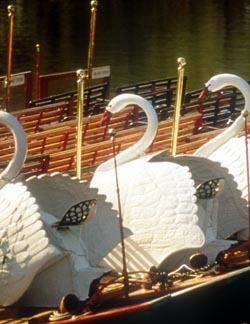 Perhaps the most toy-like and beloved fixture in the Public Garden are the world-famous Swan Boats. Owned and operated by the Paget family since 1877, the stately paddle wheel-propelled vehicles take passengers on short jaunts around the central Lagoon. The trip, one of the best bargains for visitors in town, is unquestionably the most relaxing way to take in the Garden and the surrounding skyline. It's also the best way to see some of the park's temporary residents. Sure, countless geese, ducks and pigeons make the space their home, but May 13 marks the Return of the Swans, an annual free event featuring music, dancers and other entertainment beginning at 10:30 a.m. The highlight of the event is when the guests of honor, two swans named Romeo and Juliet, return from their winter home to take their place alongside their man-made counterparts in the Lagoon. Another beloved tradition waddles into the Public Garden on Mother's Day, May 11. The 23rd annual Ducklings Day Parade, celebrating Robert McCloskey's 1941 children's classic Make Way For Ducklings, enlivens the park beginning at 1 p.m. Parents and their children are encouraged to dress up as their favorite characters from the book, which was inspired by a real-life mother mallard who, once upon a time, escorted her offspring to the Public Garden with a daily traffic-stopping procession. The Ducklings Day Parade starts on the Boston Common (across from the State House) and is led by vintage cars and the Harvard University Marching Band. The procession winds its way through Beacon Hill before proceeding to the bronze Make Way For Ducklings statues in the Public Garden. Registration begins at noon near the start of the parade. Children who participate receive prizes, refreshments and enjoy entertainment from Elizabeth Accardi of Upon A Star. A Mother's Day Grand Prize Drawing benefits Historic Neighborhood's school programs. This year's prizes include a four tickets to see the Boston Red Sox and dinner for two at Aujourd'hui. Tickets for the parade are $15 in advance, $20 day of the parade; Grand Prize tickets are $35. Call 617-426-1885 to order.